There was no formal league in 1936. Instead, the teams performed in exhibition games before engaging in playoffs. Following a string of five successful seasons, the South Saskatchewan Baseball League encountered its most serious setback entering the spring of 1936. From the camps of both the Moose Jaw entry and the Regina Nationals stemmed a desire to adandon a structured league to compete as independent clubs, free to arrange their own schedules primarily with touring American opposition. The idea was to bolster their respective clubs to the standard of the touring teams by retaining their core players, signing more imports and bringing in Canadian talent from other areas. In previous seasons, crowds had tended to increase for the few games in which top-notch travelling teams appeared. Why wouldn't a steady diet of barnstorming teams continue to sustain fan interest and generate increased gate receipts? The Nationals went so far as to have the floodlights moved from their previous home diamond at the Regina exhibition grounds to Park de Young which was to be given a major face-lift and become their new home. The smaller communities from the 1935 circuit, Weyburn and Estevan, still maintained an interest in an inter-city league but when the Regina Windsors bowed out of the picture, they were left abandoned to fend for themselves and the Southern League was left with a totally unexpected break in continuity. The lofty expectations of the Moose Jaw club, renamed the Athletics, were never remotely close to being achieved. Their roster had up to nine imports at one point as the clubhouse seemed to have a revolving door. It didn't help when at least two of the touring coloured teams reneged on their series' commitment after management of the A's had spent freely to promote the games. Fan interest just wasn't there and, as the bills began to pile up, a reshuffling of the deck chairs on the Titanic ensued. The mercenaries, one by one, were given their releases and, in mid-July, the club officially folded. The bad experience in Moose Jaw seemed to have one positive result, that being the recognition that fans in the Mill City had, over the years, a solid track record of supporting an organized league. Furthermore, they had adamantly voiced their dissatisfaction with the lack of Moose Jaw blood on the 1936 team. The Regina Nationals experienced mixed results as an unaffiliated ball club. Attendance figures were average and since they did not go overboard in bringing in outsiders to the extent that Moose Jaw had, they were able to keep their head above water on a financial level. Where they seemed to suffer the most was in their prolonged lack of success against the very best of the tourists. Playing against superior opposition did help in terms of preparing them for the provincial senior playoffs but, adversely, it tended to sap their confidence for periods of time, something which was not always easy to recoup. Overall, the 1936 experiment was a sobering experience from which a more realistic outlook emerged. 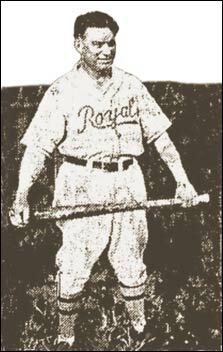 It was a year in which the tiny community of Broadview, Saskatchewan, went big time with baseball, importing American stars such as Gene Bremmer to form an integrated club long before Jackie Robinson came along. There seemed to be very few problems with integrated teams on the prairies and in the northern states (Bismarck, North Dakota formed a powerful integrated club in 1935 featuring Satchel Paige). See Daniel "Bernie" Wyatt's story on the Broadview Buffaloes. In Alberta fans had an opportunity to see a pair of college stars from the United States and a former major leaguer. Catcher John Lilly (far left) and left-handed pitcher Bill "Lefty" Daoust (left) came to Alberta baseball from the University of California. Daoust pitched for the Calgary Mustangs while Lilly played for both Calgary and Lethbridge. Former major leaguer Ike Davis (left) was the playing manager of the Medicine Hat Royals of the Southern Alberta League. When the Royals folded, he moved on to the Ponoka Panthers. The 5'7", 140 pound shortstop had headed up the Wetaskiwin Braves in Southern Alberta in 1935. Davis had one full season in the majors as shortstop for the Chicago White Sox in 1925. He had cups of coffee with Washington in 1919 and the White Sox in 1924. He also had experience in the International League, the American Association and the Pacific Coast League. He was 41 when he took over the reins in Medicine Hat. Prairie ball had its characters. Harry Cohen of the Army and Navy had teams called the Cardinals, and he bolstered one of them by offering slugging outfielder, Pete McCready, employment in the stockroom. Once, when Harry found Pete asleep on the job, Pete awoke with a perfect rationale for his nap. "You wouldn't want me to be tired out for the game, would you, Mr. Cohen?". The game wasn't for two days but Pete did have a point.